A variety of terms are used to refer to the practice of making a gift in cash or in kind in exchange for a bride: tuyana in Kabul, walwar in Pashtun communities, qalin in Balkh (from Uzbek), gala in Hazarajat, pishkesh in Herat. The term “bride price” is inseparable from all other negotiations and transactions carried out as part of marriage arrangements. 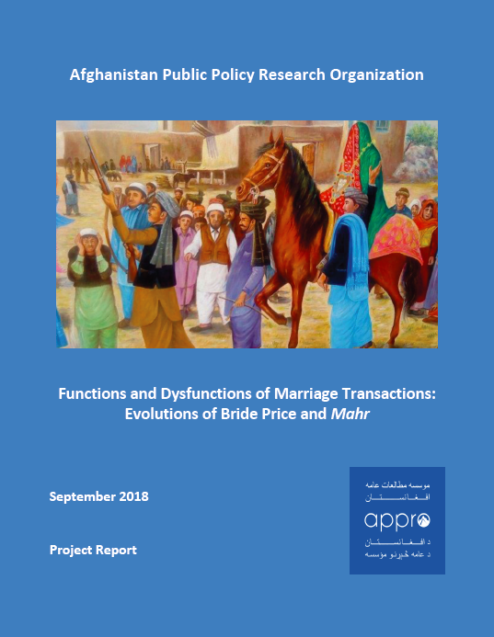 This research was carried out to examine the social and economic drivers, consequences, and evolutions of bride price and mahr in five provinces of Afghanistan, using a gender perspective. The research finds that bride price is largely practiced and accepted as an established institution. The debate surrounds mostly the amounts to be paid, rather than the payment itself. In most instances, bride price is not contested at all, while other forms of transactions were, primarily those related to expenses for ceremonies prior and after the wedding and the wedding itself. Those who call for the abolition of bride price altogether are a small minority.